In my post “Dog beds for Bull Terriers – finding the right one” I have gathered some tips on how to find the best bed for your Bull Terrier. 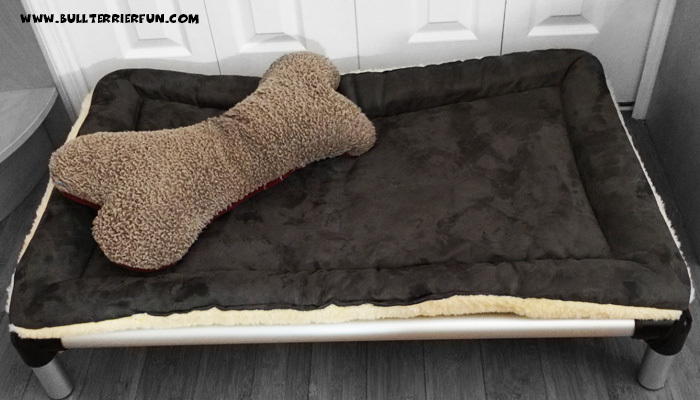 In this post I want to introduce a really great choice to consider when looking for a durable dog bed. First of all, let me tell you that this is THE – in my opinion – BEST dog bed I have ever seen: The Kuranda all aluminum chewproof dog bed! The mat and the bone cushion are not included, when buying the bed. Personally I love the all aluminum chewproof Kuranda Dog Bed, which I am introducing in another post. But there are, of course, other choices. Because not every dog has the same sleeping habits and also owners may be looking for different price ranges. Here are two other great choices of dog beds for your Bull Terrier. Please don’t disturb my “Bully Yoga Session” – Mila in her bagel bed. Searching for dog beds and finding the right one for your English Bull Terrier is not an easy task. 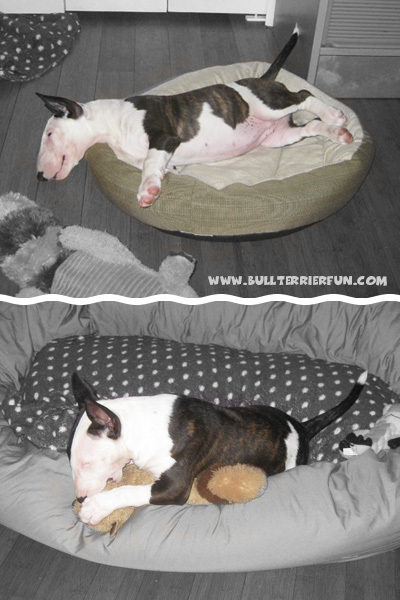 Bull Terriers are very sturdy – and so should be the dog beds for Bull Terriers. Many love to chew on wood or to take filled upholstery apart just to see what’s inside. So it’s no wonder that many of the usual dog beds end up shredded to pieces. Well, at least that makes for funny photos on Facebook, Pinterest etc… I’ve seen many of those. But of course it’s not funny when buying dog beds turns into a costly hobby. My favorite is the the chewproof, all aluminum Kuranda Dog Bed, I introduce in another essay. It is really cool and different from so many dog beds I have seen so far. But first let me give you some general information on how to find good dog beds for Bull Terriers.